From pork chops to salmon fillets to chicken thighs- one of my favorite things to do is to take a cut of meat and make it again & again until it's just right. Because, to me, cooking large cuts of meat can feel really intimidating- especially when it comes to roasting in the oven. You're not supposed to cut into it, that releases all of the juices. Don't open the oven too much. You can poke it & prod it and hope it's cooked just right. Then you set it out to rest with a magical little foil tent, fingers crossed. But when you take all of the right steps and cut into that pretty roast and it's not what you were hoping for? So frustrating. 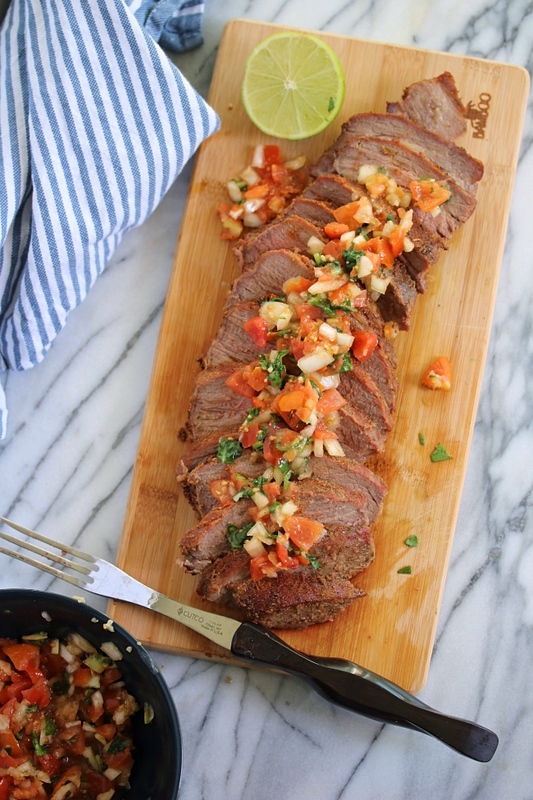 So here I am with a tried & true method for a cut that we love: tri tip! It's one of those crowd pleasing cuts of beef that's easy to do, but still requires a little (simple) love- especially if you're roasting it in the oven. Step one of perfecting this baby was the perfect rub. We love a "Santa Maria" style rub, which is basically a blend of spices that's savory, a little smoky, and goes with everything. I pat it generously into the meat, then let the flavors sink in overnight. Don't have that much time? Even an hour or two will really make a difference! My next biggest tip is to give the meat a chance to sit on the counter at room temperature for at least 15 minutes or so before popping it into the oven. It helps so much with the meat cooking through evenly. From there, your cook time will vary. My best advice here is to know what level of doneness you & your family like best (medium well for us), and use your meat thermometer from there. I swear that little gadget collected dust in a kitchen drawer for so long- but now that I've seen how much guesswork it can take out of the whole meat cooking process, I totally love & rely on it! So get yourself a meat thermometer if you don't own one already- it will become your new best friend! Especially with big, whole cuts of meat that can get tricky to cook through. Once the tri tip is finished & roasted to your liking, it will smell incredible. And that crispy outside will be hard to resist. But give it a few minutes to rest before cutting in, just to keep those juices in. Slice it thin or thick- however you like it best! From there, it's time to dress it up just right. Dip it in my Homemade Whole30 BBQ Sauce, serve it up plain, or take it down my personal favorite route: smothered in a mouth-watering salsa fresca! 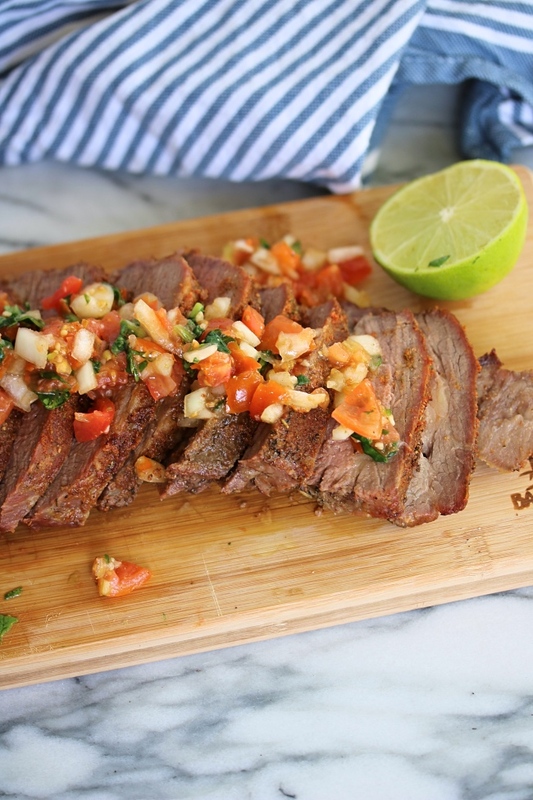 There's something about the flavor combo of that Santa Maria rub paired with the fresh salsa that does wonders- and keeps the meat SO juicy & tender. The salsa is super easy to throw together, and I pulse it in the blender to keep things even more simple. The salsa recipe makes plenty- so layer it over that meat, and then get busy dipping some plantain chips or sliced veggies into that leftover salsa. You may even want to make a double batch- it's that good! 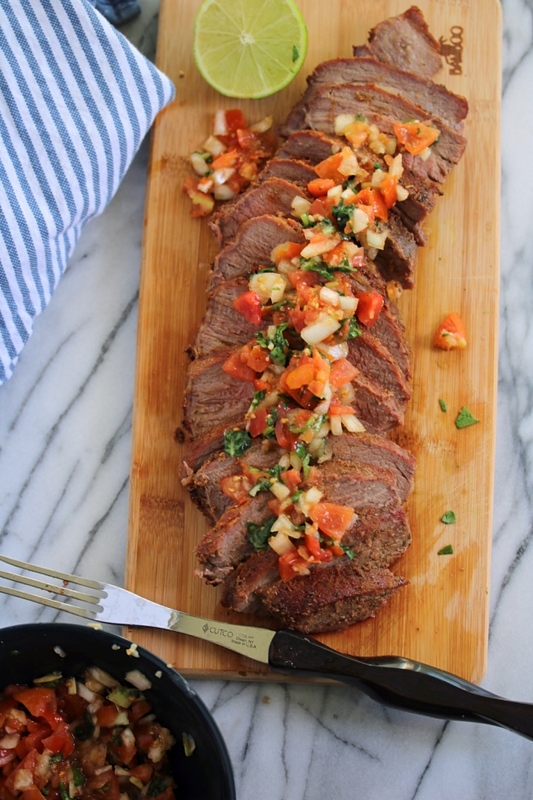 I really hope this recipe helps take the guesswork out of tri tip for you, and that you love these flavors as much as we do! Enjoy! Combine the Santa Maria spices in a small bowl. Pat the blend over the entire tri tip so the seasoning sticks well. Cover and refrigerate for 2 hours or overnight. Before cooking, allow the meat to rest at room temperature for at least 15 minutes (don't put it straight into the hot oven). Preheat the oven to 450ºF. 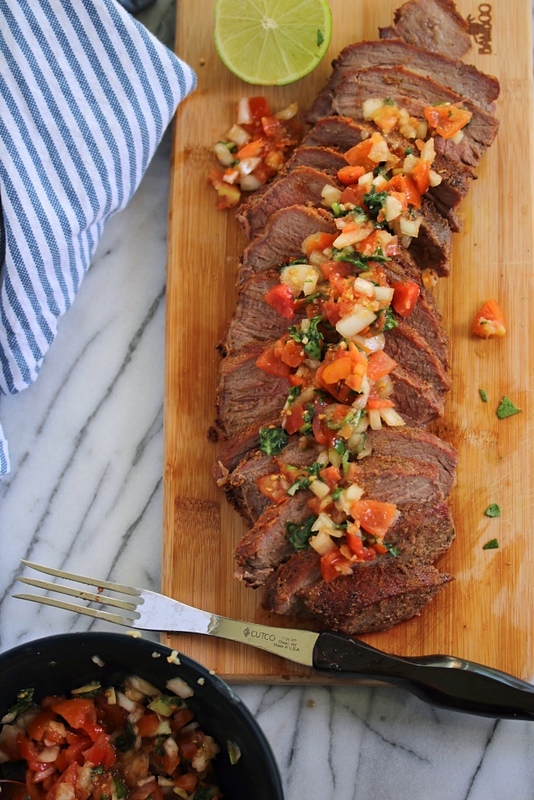 Place the seasoned tri tip in a baking dish or roasting pan and transfer to the oven. Roast for 25 to 35 minutes depending on the level of doneness you prefer (I cooked mine for around 30 minutes to an internal temperature of 145 for medium well). Chop the vegetables for your salsa, and add all of the ingredients to a blender or food processor. Give the mixture a few pulses until it's broken down to the consistency you prefer (I only pulsed around 3 times). Season to taste with salt & pepper. Refrigerate the salsa until you're ready to serve. When the meat finishes cooking, allow it to rest for around 10 minutes before slicing. Serve with salsa fresca scooped over top, on top of a green salad or with your favorite sides. 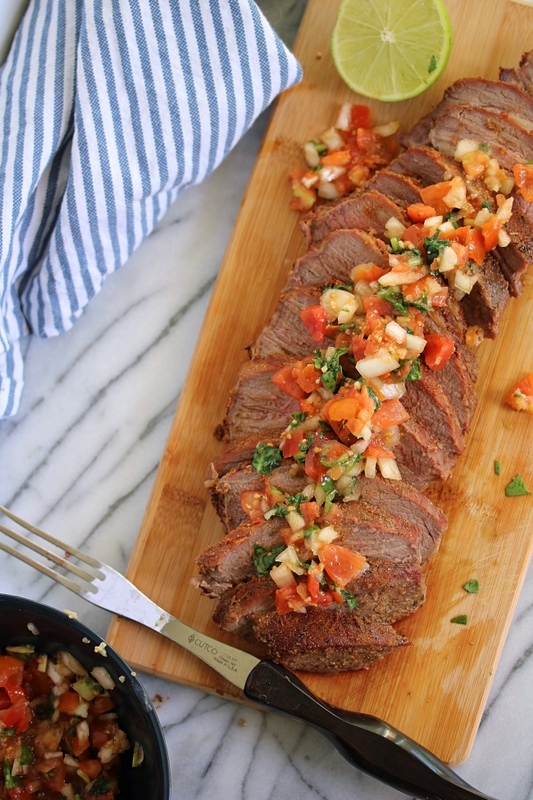 I had a tri tip in my freezer waiting for a recipe and I'm so glad I found this one. I didn't make the quick salsa but the meat was great by itself. I also only marinated it about 2 hours and it still had really great flavor. Thanks for the recipe!